"Also sacked were the commander and deputy commander of the 341st Operations Group, which oversees all three missile squadrons as well as a helicopter unit and a support squadron"
"None of the nine fired commanders were directly involved in the cheating, but each was found to have failed on leadership issues"
The US air force fired nine mid-level nuclear commanders Thursday and will discipline dozens of junior officers at a nuclear missile base in response to an exam-cheating scandal that spanned a far longer period than originally reported. Air force officials called the moves unprecedented in the history of the intercontinental ballistic missile force, which has been rocked by a string of security lapses over the past year, including a failed safety and security inspection last summer at Malmstrom Air Force Base, Montana, where the cheating happened. In a bid to correct root causes of the missile corps' failings — including low morale and weak management — the air force also announced a series of new or expanded programs to improve leadership development, to modernize the three ICBM bases and to reinforce "core values" including integrity. 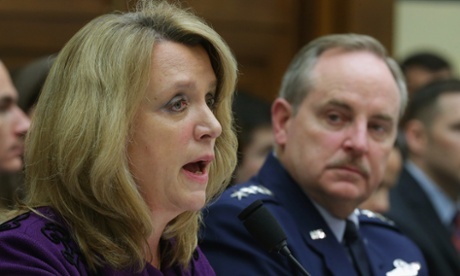 Air Force secretary Deborah Lee James, the service's top civilian official, had promised to hold officers at Malmstrom accountable once the cheating investigation was completed and the scope of the scandal was clear. None of the nine fired commanders was directly involved in the cheating, but each was determined to have failed in his or her leadership responsibilities. Investigators determined that the cheating, which officials originally said happened in August or September last year, began as early as November 2011 and continued until November 2013, according to a defense official who spoke on condition of anonymity in order to reveal details before James' announcement. It involved unauthorized passing of answers to exams designed to test missile launch officers' proficiency in handling "emergency war orders," which are messages involving the targeting and launching of missiles. When the cheating was first revealed, air force leaders condemned it as violating the most basic air force values. They also suggested that it reflected an unhealthy pressure from commanders to achieve perfect test scores. The tests are one part of a training and evaluation system that is supposed to ensure that every one of the more than 500 missile launch officers is fully proficient. The most senior person touched directly by the cheating scandal was the commander of Malmstrom's 341st Missile Wing, Col Robert Stanley. He was permitted to resign, according to a defense official. The official described the air force actions on condition of anonymity before they were announced. Nine key commanders below Stanley were fired, including the commanders of the 341st Wing's three missile squadrons, each of which is responsible for 50 Minuteman three nuclear missiles. Also sacked were the commander and deputy commander of the 341st Operations Group, which oversees all three missile squadrons as well as a helicopter unit and a support squadron responsible for administering monthly proficiency tests to Malmstrom's launch crews and evaluating their performance. Members of all three missile squadrons were implicated in the cheating, either by providing or receiving test answers or knowing about the cheating and not reporting it. No generals are being punished. Major General Michael Carey, who was fired last October as commander of the 20th Air Force, which is responsible for all three 150-missile wings of the ICBM force, is still on duty as a staff officer at Air Force Space Command but has requested retirement; his request is being reviewed. Carey was fired after a military investigation determined that he had engaged in inappropriate behavior while leading a US government delegation to a nuclear security exercise in Russia last summer. He was replaced by Major General Jack Weinstein. The cheating at Malmstrom was discovered in early January during the course of an unrelated drug investigation that included two launch officers at Malmstrom and others at several other bases; the drug probe is continuing. A total of 100 missile launch crew members at Malmstrom were identified as potentially involved in the cheating, but nine were cleared by investigators. Another nine of the 100 are being handled separately by the Air Force Office of Special Investigation; eight of those nine involve possible criminal charges stemming from the alleged mishandling of classified information. Of the remaining 82 officers, an estimated 30 to 40 are eligible to be retrained and returned to duty on the missile force; the rest face unspecified disciplinary action that could include dismissal from the air force, officials said. After the cheating was announced in January, defense secretary Chuck Hagel launched a pair of in-depth reviews of the nuclear forces to determine why the ICBM force has suffered so many setbacks over the past year. Hagel said he his goal was to restore public confidence in the nuclear force.